The repair to the kickstart was a bit more involved. On this there is a foot-piece which pivots on a boss formed on the main shaft of the pedal. The problem was caused by the “eye” of the footpiece being worn. This had allowed it to slide against the limit stops so these were worn as well but fortunately there was very little wear on the boss the footpiece pivoted on so it was decided not to worry about the boss. The “eye” first had to be bored out until it was a true bore, simplest way here would have been to clamp it on the table of a vertical mill and clean it out with a milling cutter. Not having a mill I clamped it in a 4-jaw chuck on the lathe. To get it centred I cheated a bit by clamping a bit of 1/2inch bar stock in the tailstock, putting it through the “eye” and clamping the footpiece in the chuck using that as a guide, being a trusting soul though it was checked before commencing work. Centring the pedal in the 4-jaw, The mandrel is purely to aid in this. Once the footpiece was clamped up it was soon bored out true and enough oversize to take a thinwall bush. To fit the bush it was frozen with an aerosol blaster and dropped into the “eye”. As intended it proved too tight to fit onto the boss and so was reamed to a slightly stiff fit and then the boss burnished to ease the fit. Next job was to make good the limit stops which had worn angled. Foot-piece opened out and bushed. These were filed back to square. 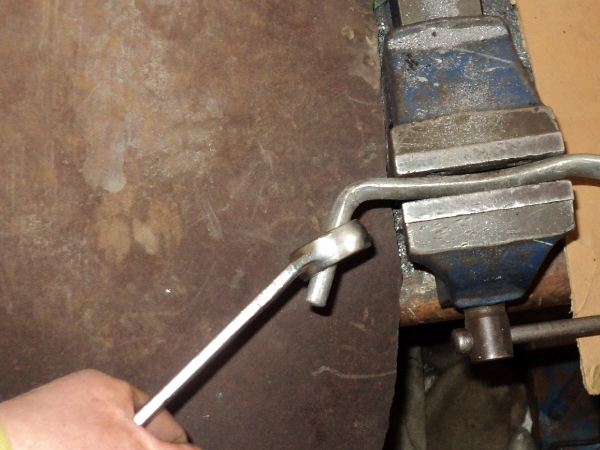 This meant however that in the “at use” position the footpiece was angled backwards so the stop on the pedal was built up with weld and then shaped using a Dremel grinder so that it stopped just before the right angle position and the stops were making full contact. Doing this means that as pressure is put on the footpiece your foot will tend to slide in towards the pedal shaft rather than out and off the end of the pedal, something that is not to be recommended when using any kickstart, never mind one on a 600cc, long-stroke, single. The foot-piece was assembled onto it’s shaft but when the end nut was fitted in place there was more vertical play than I liked, the nut was bottoming out on the end of the boss before it reached the top of the footpiece. This was got round by making up a recessed washer to go between the nut and the end of the boss that would take up this play and once this was fitted the kickstart was as good as new. This entry was posted in Panther on January 21, 2014 by Drew. After re-routing the clutch cable, next of the problems to be fixed was the gear-pedal. This is an alloy lever and a characteristic of this material is that it will age harden, that is as it ages it becomes harder and less flexible so if you try to bend it “as is” it will almost certainly break. If it is heat treated, or “annealed” first then it can be bent, but you need to be careful since it also “work hardens”, this means that the bend should be put in in one smooth pull. The lever had to be heated to the correct temperature, the easy way to determine this was to smear some soap onto the lever and then gently heat it until the soap blackened. The spline end of the lever was then clamped in a vice and steady pressure put on the other end to move it across by the required amount. This meant that the toe-piece was now at the wrong angle but as the whole lever had been annealed then this could also pressed back until its angle was correct. 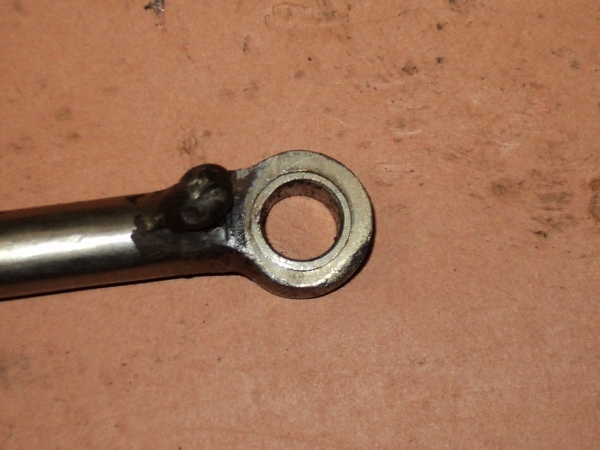 When the pedal was put back onto the bike it now cleared the exhaust sufficiently that the pedal could be moved far enough round on its splines for me to be able to change gear easily. Having fixed the problem of the slipped timing I’ve had the old girl out two or three times now and have found a few of what may be called “teething problems”. Number one was that the clutch action was very heavy. To fix this I had a close look at the control cable run and have re-routed it. This means that the bends in it are gentler and the action, though still heavy, is now much improved although the look of the run is not as “neat and tidy” as it was. The cable itself is not a “nylon lined” type and a further step will be to look to upgrading to the use of this type of cable. The clutch was also found to be dragging. When setting it up I had problems getting an even lift of the back-plate. Since this is done by adjusting the compression of the individual springs the clutch pressure springs are suspect because they are not evenly compressed. While “tired” springs would seem to be more productive of a slipping clutch, in getting the plate to lift evenly their adjustment can limit the amount of lift available, thus causing the drag, so a new set are going on order and the clutch will then be set up from scratch. Other problems were found with the foot controls. One of these is that the gear pedal is set as far down on its splines as possible, any further and it will foul on the exhaust when changing down. Even so, due to the fact that I am a long-legged beggar the angle my foot is at on the rest means I cannot bend my ankle far enough to change gear without taking my foot off the rest. By bending the lever outward enough to clear the exhaust I will be able to move it round by another spline on its shaft and so solve this problem. 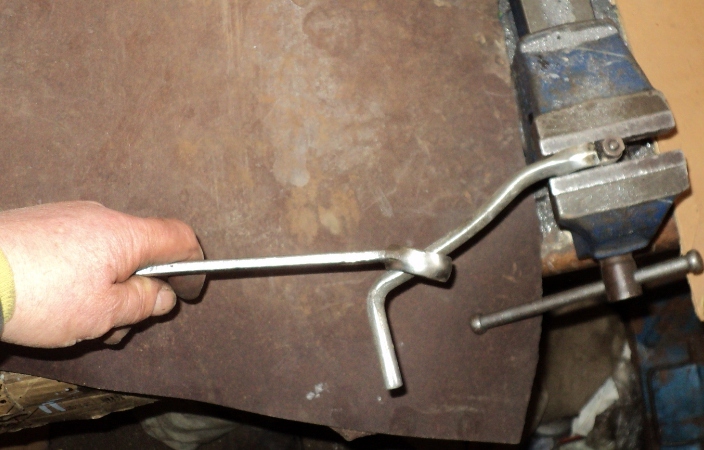 The lever is an alloy casting and it will need to be heat treated first, then bent while hot, not only that but the angle of the toe-piece will also need to be adjusted afterwards. Then we have the kickstart lever. This has a folding foot-piece which pivots on a boss formed on the end of the vertical lever. Not only that but the “stops” on both the foot-piece and the lever need building up and re-shaped so that the foot-piece will stop at 90 degrees to the lever, rather than as it is where it stops some 20 degrees past this and your foot tends to slip off the foot-piece half-way down the stroke. This is not ideal when trying to start a big Panther!. The last foot control is the rear brake. At some time before I got her the lever has been broken and welded up. 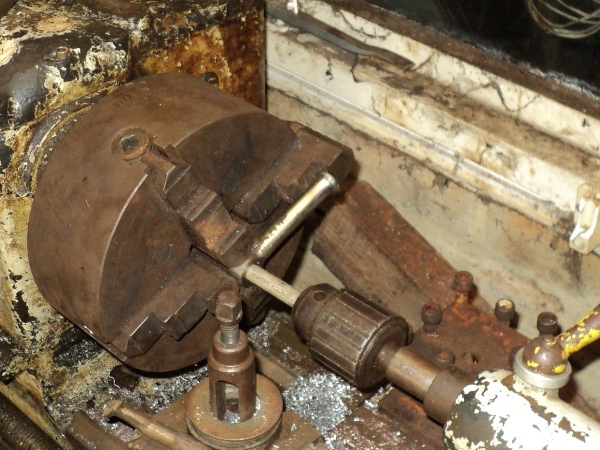 When this was done the lever was also re-shaped, bringing the toe-piece further down when in the “at rest” position. The result of this is that the toe-pad is contacting the exhaust before it’s rear brake actuating arm reaches full stroke. Seen from the side the lever at present is crescent shaped where in fact it should be straight so this lever is going to have to be brought back to its original form. None of these can be said to be a major problem but all will need to be remedied before any serious riding can be undertaken. This entry was posted in Panther on January 5, 2014 by Drew.